Spend your hard-earned bells on custom clothing. Animal Crossing: Pocket Camp has grown again with the introduction of clothes crafting, which is now available for you to tinker with. You can now become a fashionista on your own time with the mobile version of the popular sim instead of waiting to find cooler duds t the markerplace. 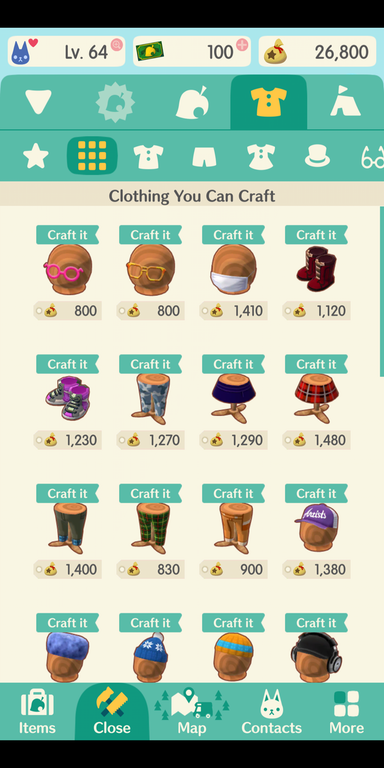 Craftable clothing lets you create new shirts, dresses, pants, hats, shoes, and various accessories with resources you've gathered throughout your time with the game. Previously, you'd have to chill with the Able Sisters to purchase additional clothing, but it was always on a rotating basis. Now there's no need to wait, and you can simply make whatever it is you're looking for, so long as you have the materials to do so. You can head to the Craft menu and choose any of the clothing you see in the catalogue to special-order it from Mabel herself. She'll get to work with all the materials you've provided, but it can take a long time to complete. You'll need both the required amount of bells and resources to bring your fashion pieces to fruition, so keep that in mind before you head out to manufacturer your own goodies. Unfortunately, not all clothing will be available via crafting, but a good portion of it can be created without having to keep checking what wares Mabel has on offer. It should add an interesting new dimension to the game, at least in terms of customization, and it's available to try out now.